Chakra Balancing: Is it Important for Your Health? Chakra Balancing: Is it Important? Do I Need to Balance My Chakras? Ever have one of those moments where, for one reason or another, you can’t seem to answer a straight question with a simple response? I had one of those moments the other week. As I was packing up my booth at the tail end of Phoenixville’s First Friday, a gentleman stopped by asking me about chakra balancing. Amidst the hustle and bustle of clean up, with loud music in the background, I launched into a long dissertation about chakras. In my defense, it was at the tail end of a very long day of a very long week. All I wanted was to get packed up and go home, get some dinner, and get ready for bed. Poor fellow. He did not really know much about the chakras (thus my long and convoluted reply), but of course, all he wanted was a simple answer. Will chakra balancing help me? Similarly to balancing the wheels of your car, balancing your chakras helps to improve and maintain optimum performance. Sticking with the car analogy for a moment: when the wheels are not balances, they become wobbly and add undue stress, wear and tear to your tires and your vehicle. Performance decreases, as does the life of the tire. When your chakras are out of balance, they become too open or too closed. They do not effectively manage energy transmission and reception in your body. These imbalances create more stress and impact how you interact with the world around you. How Frequently Do You Need to Balance Your Chakras? 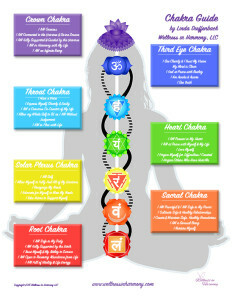 Chakras are rich and complex energy centers that oversee all aspects of your life. From your physical body to self esteem, creativity and your relationships with the world. They are not just energy transmitters and receivers, but they also digest and process your life experiences. Your Chakras carry past traumatic experiences and unresolved pain. Imbalances are the result of these experiences and can become chronic conditions, therefor the healing process will take time. It is also important to understand the you are constantly moving through the world, and your body and energy is impacted by your life experiences every day. Keep in mind, Chakra balancing is not a “once and done” activity. Just like bathing regularly, Chakra balancing is a necessary part of your regular self-care routine. Adopt daily practices to maintain overall Chakra health and find skilled practitioners to support you with deeper levels of healing. Fortunately, there are many tools and practices that help balance your chakras. Each work at different levels and, depending on the amount of compromise or damage within the chakra, will vary in its effect. Some practices can be done on your own while others will require a trained practitioner. Energy Healing: Reiki, Acupressure, Acupuncture, etc. 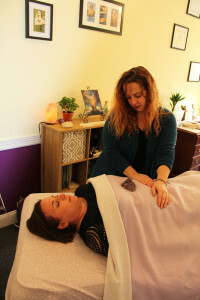 Energy healing practices such as Reiki, Acupuncture and Acupressure are wonderful tools for rebalancing the chakras and improving the flow of energy throughout your body. Receiving energy work on a regular basis helps to reduce stress, improve chakra health, increase energy and vitality, and so much more. I recommend getting weekly or bi-weekly sessions for optimum results. More frequent sessions may be required when chronic conditions exist. Meditation is one of the best practices that you can adopt for your overall health and well-being. There are Chakra Balancing meditations and practices that you can use, however any meditation will bring benefit to your chakra system. 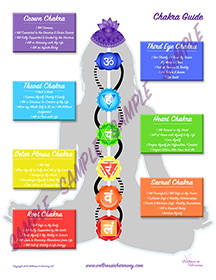 Our Chakra Healing Guide poster and meditation takes you through a gentle meditative practice that supports your Chakra health – check it out here. Elizabeth Frediani’s book, Where Body Meets Soul is a wonderful guide to overall energetic self care. Exercise is a great way to move stuck energy in your body. Yoga, Tai Chi and Qi Gong are all wonderful forms of exercise that help you connect with and balance the energy in the body. These practices facilitate energy flow, help release stagnant and stuck energy, and revitalize the body. Sign up for regular classes or get some DVD’s to use for daily practice (or both). Click here for a series of yoga poses that help balance each of the chakras. Chakra Clearing with Applied Integration (CCAI) offers healing, clearing and balancing for acute or chronic conditions that impact your daily life experience. Imbalances in your Chakras can play out in many ways depending on the affected chakra(s), and can be connected to challenges related to work, relationships, family dynamics, money, self-esteem, intimacy, communication, mental, emotional or physical health conditions. CCIA is a gentle, yet powerful tool for deep, transformational healing that was developed by Elizabeth Frediani. Sessions can be held in person or via Skype. To learn more about this method of Chakra healing, click here. In the coming weeks, I will be posting blogs with information and healing practices specific to each chakra, so stay tuned. Linda has over 15 years experience as an energy healer, coach and personal development expert. She specializes in empowering you to overcome the patterns and habits that are keeping you feeling stuck and overwhelmed with your life. Her areas of training and expertise include personal empowerment, self-care skills, stress management, healthy relationships, effective communication, suicide prevention, and trauma. To learn more about Linda, click here. Interested in working with Linda? Click here. Hello there I am so grateful I found your website, I really found you by error, while I was researching on Bing for something else, Anyways I am here now and would just like to say thanks for a remarkable post and an all round enjoyable blog (I also love the theme/design), I don’t have time to go through it all at the minute but I have saved it and also added your RSS feeds, so when I have time I will be back to read more, Please do keep up the superb work. I am blessed I have found your website. I really loved your post, its awesome to read this outstanding post. Since you said that balancing my chakras helps to improve and maintain optimum performance, I thought that reiki healing could help me do that. I like that one of its benefits is that it can give me mental focus as you suggest which can help me gain lots of knowledge in the future. I am aware that it is not a once and done activity as others say so I’ll enroll in a course so I can do this myself once I’m done with the session.